Chicken | Have YOU Ben Starr Struck? Homemade stocks make ALL the difference in recipes, particularly in soups, sauces, and gravies. But who’s got room in their freezer for gallons and gallons of homemade stock? Lots of TV chefs will tell you to reduce the stock a bit and then freeze it in ice cube trays, but then you have to maintain a separate set of ice cube trays, and then you’ve STILL got big ziploc bags of frozen stocksicles in your freezer, and when you add them to a sauce, it brings the temp of the sauce down, which means longer cooking times. Ben to the rescue! 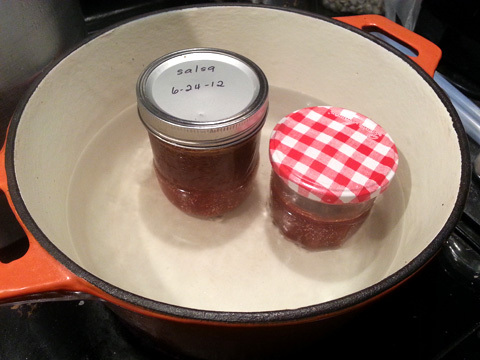 But before I give away my big homemade stock storage secret, we should chat a little bit about stock. ANY time you have bones of any kind, or shells from shellfish, toss them in a plastic grocery bag into your freezer. Yes…this takes up a bit of space. But as soon as you have a couple of chicken carcasses or a few pounds of beef or pork bones, or a few bags of shrimp/crawfish/lobster shells or fish skeletons, you’ve got enough to make a LOT of stock and they can go right into the pot. I roast whole chickens a lot, typically at least once a week. But even if you don’t go to that work, you certainly pick up rotisserie chickens at the grocery store deli every once in awhile, right? How about fried chicken? All those bones can go into the freezer when you’re done eating the meat. I’ve found that 2 chicken carcasses, or 12-16 fried chicken bones will make a couple gallons of really great stock. If you’ve got a pressure cooker, making stock is a breeze, and your stock turns out MUCH richer and fuller flavored than stock made in a traditional pot. 20 minutes in the pressure cooker for chicken stock, an hour for beef/lamb/pork (roast the bones first at 400F for an hour, tossed in canola oil) or smoked ham hock stock. If you want, toss in an onion quartered (you don’t even have to peel it) and a handful of garlic cloves (you don’t even have to peel them), a whole unpeeled carrot or two, and a few stalks of celery broken in half. Or really whatever you’ve got. Just bones is okay, too. All the stuff in the stock is going in the trash anyway, so don’t worry about peeling and cutting everything, just toss it all in there. Add a Tablespoon of vinegar or lemon juice to help extract calcium and collagen from the bones and connective tissues, ensuring a mouth-coating, rich stock. If you don’t have a pressure cooker, use a large stock pot, cover it, and simmer very gently for 1 hour for chicken stock, or 3 hours for beef/lamb/pork or smoked ham hock stock. For shellfish or fish stock, avoid the pressure cooker. Toast shellfish shells in canola oil, add water and any aromatics, and bring just to a bare simmer for 30 minutes, then strain. Pour the stock through a colander to strain out the solids, and discard or compost them. Then return the stock to the pot and bring to a boil on high. Then just leave it there boiling away. You’re aiming to reduce it to almost nothing, which make take several hours. But when the liquid level gets low and the stock gets really thick, you want to be around to keep an eye on it. When it looks like the stock is as thick as gravy, cloudy and opaque, probably only a cup or two of liquid left, you’re done. Turn off the heat and let it cool. 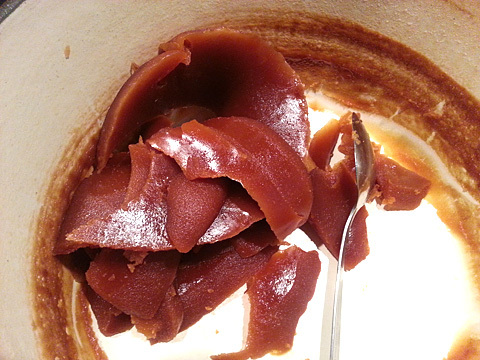 The stock concentrate will solidify into something like very hard jelly or paste. Then just scrape it off the bottom of the pot and put it into a jar, pressing it down as much as possible to firmly pack it in the jar. Then just put the jar in the fridge for future use. Use as much or as little as you want to make your stock. A Tablespoon or two of this stuff will make a quart of delicious homemade stuck. A teaspoon in a cup of sauce will lend explosive flavor and richness. It’s homemade bouillon, without all the preservatives and MSG. 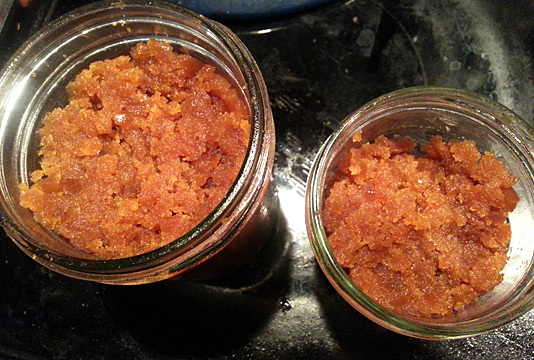 Or, you can then put the jars in a hot water bath to melt the stock concentrate into a solid mass in the jar. This lets you put more stock concentrate in each jar, but doesn’t necessarily help you measure it out more easily. There’s almost always more room in my fridge than in my freezer. After all, my fridge is bigger, and food moves in and out of it much more quickly. A pint jar of stock concentrate in my fridge door is enough to make 2-4 gallons of full flavored stock. Imagine how much space that would take up in the freezer? Or imagine 8-16 boxes of grocery store stock, which doesn’t taste nearly as good, taking up that space in my pantry? No way! Having stock concentrate is SO much handier than having regular stock around. It’s concentrated! You don’t have to wait for 20 minutes for a sauce made of stock to reduce, simply add a spoon of stock concentrate and a bit of wine and your sauce is ready in seconds. After discovering this method, it revolutionized my cooking. Yes, it’s a bit of a hassle on stock making day. But it’s not like you have to sit there at the stove for hours, just check on it once every 20 or 30 minutes, then baby it for the last few minutes until it’s appropriately reduced. Then you’ve got stock to last you a month or longer! Totally worth it, at least for me! Share your stock secrets with us by commenting below, and subscribe to my blog near the upper right corner of your screen so you don’ t miss any great articles and recipes!